Learn how to time the planting of your seasonal crops with our Growing Dome Planting Schedule. Planning for the upcoming season should generally take place a month before your previous seasonal crops are finished producing. This gives you ample time to plan, order, and organize all your seeds. In Colorado (and all other states in zones 4-5) February, August, and December are the best times to plan for your upcoming seasonal crops. However, regardless of what zone you’re in, some of the major priorities at hand are soil amendment, preparing for pest mitigation, bed design, and moving seasonal plants. Before diving into the Growing Dome Planting Schedule, soil amendment always takes first priority, as none of your crops will grow if the soil is spent. Growing year-round in a Growing Dome will make your soil especially prone to nutrient deficiency. If you have not changed or amended your soil at all within the last year, dig around in various parts of your garden beds and look at the quality of the soil. Please refer to our articles on soil amendment and soil composition for more detailed information on caring for your soil. The planning seasons are also a great time to reduce your potential pests next year by designing your beds with pest resistant plants such as garlic, marigolds, wormwood (in a pot), and other strongly scented plants. It is also wise at this time to stock up on items such as wasp, mice, and bug traps so that you’re prepared for when the time comes. Copper mesh or wire is another useful item to have on hand; Placing copper around new seedlings distributes a charge which shocks and repels insects and slugs. Because of the fertilizer they produce, killing slugs is only advised when there are too many – it is much better to control them using copper around new shoots. If you are bringing outside plants into the Growing Dome (or vise versa), focus on moving your smaller plants and/or pruning the larger ones; More established and larger plants can often go into shock when moving from one extreme temperature to another. Spraying your plants with SAFER (or an equivalent mild soap) and cleaning the leaves will remove potential pests and eggs found on the plant. Below are a few example crops to plant in your Growing Dome depending on the season. 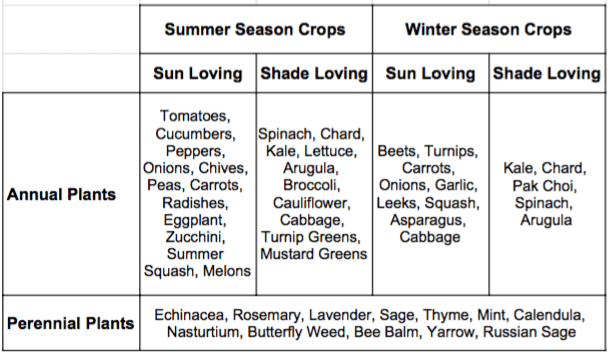 In order to optimize the use of our Growing Dome Planting Schedule (see below), we would advise utilizing this list of seasonal crops. All perennial plants will stay in your soil year-round. To ensure their success, please remember to provide them with ample room- do not plant them too close to the edges of your beds, as they will get large quickly. Perennials also need far less water than annual plants do. Mint should always be in a contained pot and yarrow is a great ground cover for beneath fruiting trees. We suggest spacing your perennials roughly 5 feet apart as makeshift bed dividers. **Note: Sun loving crops should be planted around the periphery of your Growing Dome while shade loving crops should be planted closest to the pond/water tank. There are roughly three main seasons for planting in the Growing Dome: mid March, mid September, and early January. Below you will find our Growing Dome Planting Schedule specific to southwest Colorado and all other states in growing zones 4-5. The time to begin planting warm season crops is around mid March when the soil is warm enough for seeds to germinate. To ensure proper germination, the soil needs to have an average temperature of 60 degrees Fahrenheit. One piece of advice to take into consideration is planning for shade in the heat of the summer. 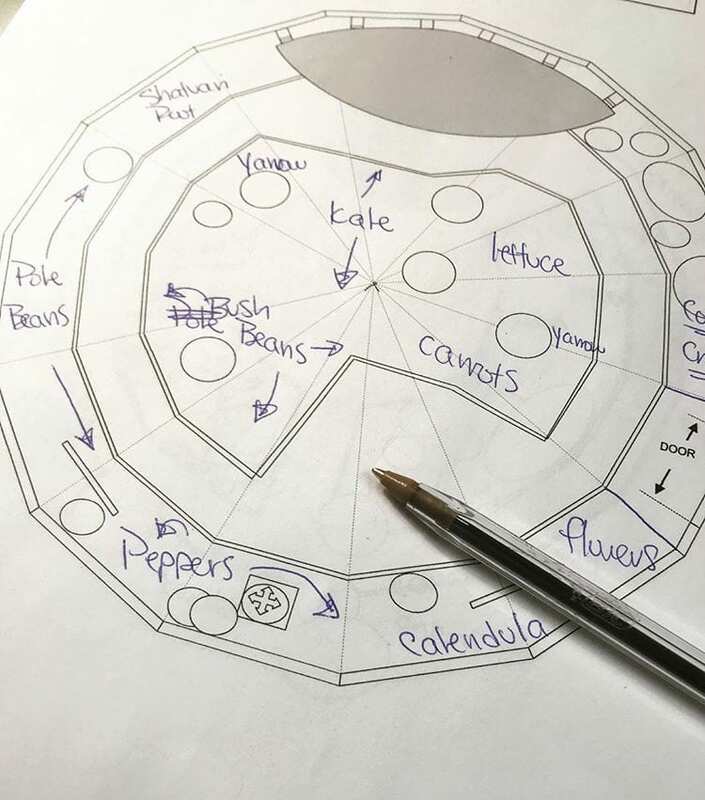 Especially if you live in a hot weather climate, it can be advantageous to plant vining fruits and vegetables in the outer beds of the dome to create shade and cool the domes during the summer. The next period for sowing seeds in your dome is around mid September. These are the seeds for your hearty winter crops. At this time of the year your summer crops will potentially still be producing, though likely past their peak. Because of this, it may seem as if you have limited room to seed new crops. However, you may also notice that most of the summer crops now have large foliage, higher up in the Growing Dome, leaving bare patches of soil available to direct seed winter root vegetables that don’t transplant well (ie: turnips, beets, radishes, carrots, etc.). The leafy vegetables can be sown in flats, which we would advise you to place on the crossbar of the Growing Dome pond feature. This space not only gives you extra room to start seeds, but it will also keep your seeds warm and moist compared to placing them around the periphery of the dome. These seeds will be ready for transplanting to their final location, about mid October. This will ensure a timely supply of veggies all winter. The third season of seeding is in January, a time in which you will sow a second round of cold weather seeds. 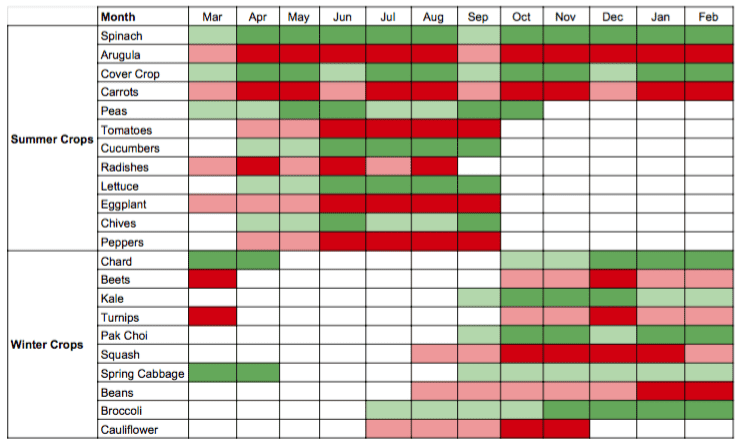 Generally speaking, winter greens go to seed in February and March. Using this strategy, you will be able to have continuous greens available until May or June. Please read the above information for September, as January seeding time is similar. If you so choose, many gardeners allow this ‘middle season’ to be the time in which their beds rest and allow for the rejuvenation of the soil. In our Growing Dome Planting Schedule you’ll find that the cover crop can be grown year round. However, January is a great time to optimize this amazingly nutrient dense crop for the health of your soil. Again, please refer to our articles on soil amendment and soil composition for more detailed information on caring for your soil. To learn more about the health of your soil and what to plant in your Growing Dome® Greenhouse, join our online learning community here. Tell Us About Your Dream Garden!